The Outcast Uno is a small but advanced slug pellet applicator. It is designed for use on drills, rolls or ATV spreading from 3m – 18m using spinning discs. The pellets are positively metered on to the centre of the disc with an apcal metering cartridge ensuring absolute accuracy of application according to forward speed, measured with a GPS receiver unit. Customers feel that the Outcast Uno is simple to operate and they like the fact that it basically looks after itself. Once the straightforward calibration has been carried out just fill up and go, safe in the knowledge that exactly the correct amount will be evenly distributed. The Outcast V2 is a sprayer mounted slug pellet applicator. It is a well proven machine developed since 2005 and can now achieve spread widths of up to 48m. It uses a unique system of satellite spinning disks on the sprayer boom. The slug pellets are metered from a front or rear mounted hopper into an airstream and blown to satellite spinning discs on the booms for distribution. The Outcast V2 is the only slug pellet applicator on the market that genuinely gives even distribution at 36m and over. Each spinning disc is used to spread the pellets a distance of 12 metres in total – 6 metres from the centre line of the disc. The Outcast Duo is a twin spinning disc applicator. It is designed to fit on to the flat bed of a utility vehicle, like a Gator or Mule. It spreads to a distance of 24m and at typical forward speed of 15kph. The control system uses GPS speed sensing and pellets are metered onto each spinning disk so that you can be assured that your application is uniform and accurate. 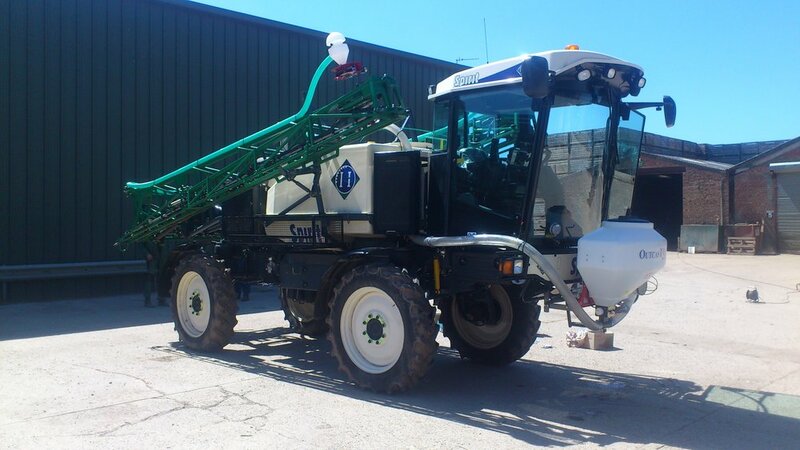 The Outcast Duo can be fitted to the front or rear tractor linkage or fitted to the front of a 24m sprayer.